If truth be told, I’ve always been a bit of a digital addict. I’d purchase every new iPhone on the day of release, swap traditional pen-and-paper note taking for that on a tablet and head to Skype rather than an in-person meeting. In my past life as a travelling sales executive, this wasn’t always the case. I’d need to mix that digital world (which, back then, was still burgeoning) with face-to-face meetings and communication. When I left to work in the world of freelancing, I went completely digital. And, for a time, it worked brilliantly, but I soon began to realise that it wasn’t fully sustainable. This might sound odd in a society where many people practically live a digital existence, be it checking into wherever they happen to be on Facebook or documenting their every movement on Instagram. But in reality – and certainly when it comes to business – we need to mix analogue life with the digital realm if we’re to achieve our goals, further our careers and become successful. Despite the amount of stick it gets these days, I’m still a big fan of email. It’s one of the best ways to send in-depth messages to people and a great way to stay in touch. Too much email, however, and it’s easy to lose your focus and get lost in a world of forwards and replies. The same goes for instant messaging, which appears to have been adopted by many people in business. I’ve discovered that to remain as productive as possible, I need to mix email and text communication with more traditional methods of keeping in touch. So, if I think an in-person meeting would make sense, I’ll set it up. Equally, if typing out a text message seems needlessly laborious, I’ll call, instead. I never thought I’d say this, but I no longer use my iPad solely for taking notes. Over the last few months, I’ve really got into something called ‘bullet journaling’. This is essentially the method by which one records notes, builds to-do lists, tracks project progress and organises one’s life – with pen and paper. There are lots of guiding principles for bullet journalling, but the reason it’s becoming so attractive for so many people is the creative freedom it offers. With a pen and notebook, the only limit is your own creativity and imagination. You can draw up a to-do list in any form you like and take notes without being restricted by software limitations. Try it – it’s fantastic. Anyone who prides themselves on being productive will know how important downtime is. What you do during that downtime will have a direct impact on how productive you can be, and it’s for this reason that I’ve decided to continue my new love for mixing digital and analogue during my personal time. For instance, I don’t spend anywhere near as much time on social media as I used to, and rather than take photos which are instantly added to Instagram, I’ll take them with a DSLR camera and enjoy them ‘offline’. I’ll also mix activities like dog walking and time at the gym with gaming and other digital endeavours. As a result, I’ve built a mindset that values both sides of the divide but which isn’t inclined to spend too much time within either one. The number of times my phone (or, for that matter, smartwatch) pings, dings and dongs throughout the day to notify me of new messages, app updates and newsflashes has been put into stark reality since I started investing more time in analogue productivity. Now that I’m using bullet journaling more and conducting in-person meetings, I’m more inclined to remove digital distractions. The phone often gets muted – completely – and I’ve trimmed the notifications I receive so that only the absolute most urgent ones are capable of disturbing my workflow. And it has worked wonders. I’ll admit it – I still love the ability to take notes on my iPad with the Apple Pencil. That probably won’t change. However, there’s always been two things that have bothered me about it. Firstly, there’s always the chance a battery will run out during a vital meeting or that I lose the notes I’ve spent an hour writing during a software crash. Secondly, it isn’t particularly tactile. No matter what today’s engineers do, they’re still limited by screen technology, and that means virtually any stylus and screen combination is nothing like the experience of pen and paper. Since I’ve picked up ‘real’ pens once more, I’ve been reminded how important analogue tactility is. The feeling of a pen gliding elegantly across a piece of paper becomes rather addictive when you’ve spent years tapping, prodding and poking LCD screens. For me, I’ve found mixing the two disciplines satisfies my digital desires and awakes my inherent love of the more traditional things. 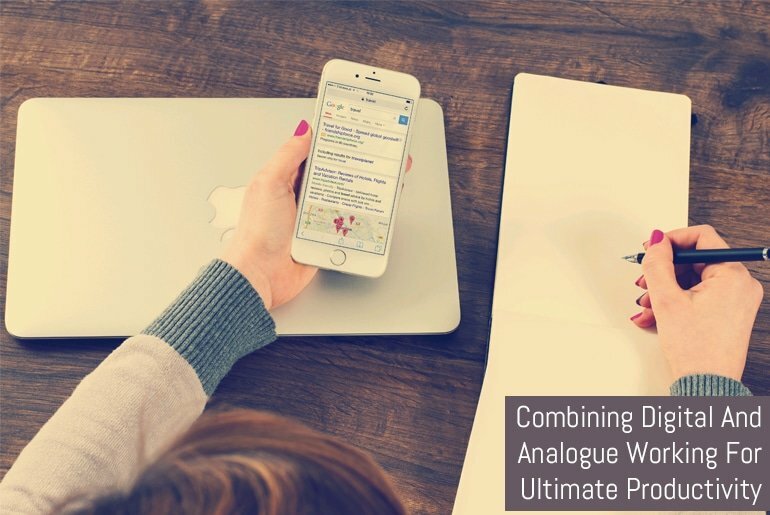 Trust me – if I can mix analogue and digital working to make myself more productive, so can you. I hope you’ve found this blog inspiring enough to invest some time in the analogue elements of your life! Mark Ellis is a freelance writer who specialises in copywriting, blogging and content marketing for businesses of all sizes. Mark's considerable experience at director level and deep interest in personal and business success means he's ready to comment on anything from freelance writing to workplace dynamics, technology and personal improvement.